Padmasambhava[note 1] (lit. "Lotus-Born"), also known as Guru Rinpoche, was an 8th-century Indian Buddhist master. Although there was a historical Padmasambhava, nothing is known of him apart from helping the construction of the first Buddhist monastery in Tibet at Samye, at the behest of Trisong Detsen, and shortly thereafter leaving Tibet due to court intrigues. 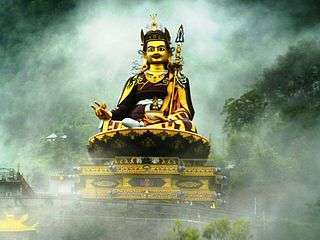 A number of legends have grown around Padmasambhava's life and deeds, and he is widely venerated as a 'second Buddha' across Tibet, Nepal, Bhutan, and the Himalayan states of India. In the eleventh and twelfth centuries there were several competing terma traditions surrounding Padmasambhava, Vimalamitra, Songtsän Gampo, and Vairotsana. At the end of the 12th century, there was the "victory of the Padmasambhava cult," in which a much greater role is assigned to the role of Padmasambhava in the introduction of Buddhism to Tibet. 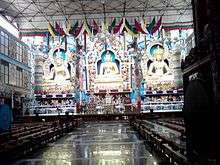 Bhutan has many important pilgrimage places associated with Padmasambhava. The most famous is Paro Taktsang or "Tiger's Nest" monastery which is built on a sheer cliff wall about 500m above the floor of Paro valley. 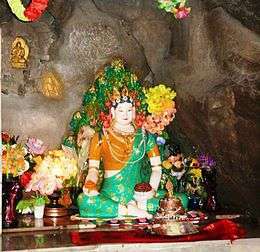 It was built around the Taktsang Senge Samdup (stag tshang seng ge bsam grub) cave where he is said to have meditated in the 8th Century. He flew there from Tibet on the back of Yeshe Tsogyal, whom he transformed into a flying tigress for the purpose of the trip. Later he travelled to Bumthang district to subdue a powerful deity offended by a local king. According to legend, Padmasambhava's body imprint can be found in the wall of a cave at nearby Kurje Lhakhang temple. He has the youthful appearance of an eight-year old child. ↑ Wylie: 'ja' lus, pronounced Jalü. ↑ The subjection of concurring deities and demons is a recurrent theme in Buddhist literature. See also Vajrapani and Mahesvara and Steven Heine's "Opening a Mountain". ↑ Tibetan: སྔ་འགྱུར།, Wylie: snga 'gyur, ZYPY: Nga'gyur , "school of the ancient translations. ↑ The Tibetan script and grammar was actually created for this endeavour. ↑ Kværne, Per (2013). Tuttle, Gray; Schaeffer, Kurtis R., eds. The Tibetan history reader. New York: Columbia University Press. p. 168. ISBN 9780231144698. 1 2 Schaik, Sam van. Tibet: A History. Yale University Press 2011, page 34-5, 96-8. ↑ "Padmasambhava". Encyclopædia Britannica. Retrieved 5 October 2015. ↑ Buswell, Robert E.; Lopez, Jr., Donald S. (2013). The Princeton dictionary of Buddhism. Princeton: Princeton University Press. p. 608. ISBN 9781400848058. Retrieved 5 October 2015. ↑ Harvey, Peter (2008). An Introduction to Buddhism Teachings, History and Practices. (2 ed.). Cambridge: Cambridge University Press. p. 204. ISBN 9780521676748. Retrieved 6 October 2015. 1 2 Gyatso, Janet (August 2006). "A Partial Genealogy of the Lifestory of Ye shes mtsho rgyal". The Journal of the International Association of Tibetan Studies (2). ↑ Davidson, Ronald M. Tibetan Renaissance. pg 229. Columbia University Press, 2005. ↑ Davidson, Ronald M. Tibetan Renaissance. pg 278. Columbia University Press, 2005. 1 2 Schaik, Sam van. Tibet: A History. Yale University Press 2011, page 96. ↑ Trungpa (2001) 26. For debate on its geographical location, see also the article on Oddiyana. ↑ Keown, Damien (2003). A Dictionary of Buddhism (1 ed.). Oxford: Oxford University Press. p. 203. ISBN 9780198605607. Retrieved 11 February 2016. (subscription required (help)). ↑ Tsogyal (1973) volume I deals with Padmasambhava's life in India. ↑ Lama Chonam and Sangye Khandro, translators. The Lives and Liberation of Princess Mandarava: The Indian Consort of Padmasambhava. (1998). Wisdom Publications. 1 2 Snelling 1987, p. 198. ↑ Snelling 1987, p. 196, 198. ↑ Sherpa, Lhakpa Norbu (2008). Through a Sherpa Window: Illustrated Guide to Sherpa Culture. Kathmandu, Nepal: Vajra Publications. ISBN 978-9937506205. ↑ Norbu 1987, p. 162. 1 2 3 4 5 6 7 8 9 10 11 12 13 14 Chökyi Drakpa, A Torch for the Path to Omniscience: A Word by Word Commentary on the Text of the Longchen Nyingtik Preliminary Practices. ↑ John Huntington and Dina Bangdel. The Circle of Bliss: Buddhist Meditational Art. Columbus Museum of Art, Columbus, Ohio, and Serindia Publications, Chicago. 2004. p. 358. ↑ Khenchen Palden Sherab Rinpoche The Eight Emanations Of Guru Padmasambhava; Rigpawiki Eight Manifestations of Guru Rinpoche; For the eight manifestations as terma, see: Padmasambhava - 8 Froms: Dorje Drolo. 1 2 3 4 Boord 1993, p. 115. ↑ Schmidt and Binder 1993, pp. 252-53. ↑ Sogyal Rinpoche (1992). The Tibetan Book of Living and Dying, pp. 386-389 Harper, San Francisco. ISBN 0-7126-5437-2. ↑ Ian A. Baker: The Lukhang: A hidden temple in Tibet. ↑ Dowman, Keith. (1984). Sky Dancer: The Secret Life and Songs of the Lady Yeshe Tsogyel. p. 265. ↑ Tibetan Wylie transliteration and Sanskrit transliteration are found in Dowman, Keith. (1984). Sky Dancer: The Secret Life and Songs of the Lady Yeshe Tsogyel. p. 193. ↑ Mandelbaum, Arthur (August 2007). "Denma Tsemang". The Treasury of Lives: Biographies of Himalayan Religious Masters. Retrieved 2013-08-10. ↑ Mandelbaum, Arthur (August 2007). 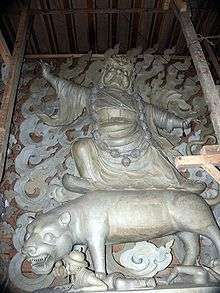 "Nanam Dorje Dudjom". The Treasury of Lives: Biographies of Himalayan Religious Masters. Retrieved 2013-08-10. ↑ Dorje, Gyurme (August 2008). "Lasum Gyelwa Jangchub". The Treasury of Lives: Biographies of Himalayan Religious Masters. Retrieved 2013-08-10. ↑ Mandelbaum, Arthur (August 2007). "Gyelwa Choyang". The Treasury of Lives: Biographies of Himalayan Religious Masters. Retrieved 2013-08-10. ↑ Mandelbaum, Arthur (August 2007). "Gyelwai Lodro". The Treasury of Lives: Biographies of Himalayan Religious Masters. Retrieved 2013-08-10. ↑ Garry, Ron (August 2007). "Nyak Jñānakumara". The Treasury of Lives: Biographies of Himalayan Religious Masters. Retrieved 2013-08-10. ↑ Mandelbaum, Arthur (August 2007). "Kawa Peltsek". The Treasury of Lives: Biographies of Himalayan Religious Masters. Retrieved 2013-08-10. ↑ Mandelbaum, Arthur (August 2007). "Langdro Konchok Jungne". The Treasury of Lives: Biographies of Himalayan Religious Masters. Retrieved 2013-08-10. ↑ Mandelbaum, Arthur (August 2007). "Sokpo Pelgyi Yeshe". The Treasury of Lives: Biographies of Himalayan Religious Masters. Retrieved 2013-08-10. ↑ Mandelbaum, Arthur (August 2007). "Lhalung Pelgyi Dorje". The Treasury of Lives: Biographies of Himalayan Religious Masters. Retrieved 2013-08-19. ↑ Mandelbaum, Arthur (August 2007). "Lang Pelgyi Sengge". The Treasury of Lives: Biographies of Himalayan Religious Masters. Retrieved 2013-08-19. ↑ Mandelbaum, Arthur (August 2007). "Kharchen Pelgyi Wangchuk". The Treasury of Lives: Biographies of Himalayan Religious Masters. Retrieved 2013-08-19. ↑ Mandelbaum, Arthur (August 2007). "Odren Pelgyi Wangchuk". The Treasury of Lives: Biographies of Himalayan Religious Masters. Retrieved 2013-08-19. ↑ Mandelbaum, Arthur (August 2007). "Ma Rinchen Chok". The Treasury of Lives: Biographies of Himalayan Religious Masters. Retrieved 2013-08-19. ↑ Mandelbaum, Arthur (December 2009). "Nubchen Sanggye Yeshe". The Treasury of Lives: Biographies of Himalayan Religious Masters. Retrieved 2013-08-19. ↑ Mandelbaum, Arthur (August 2007). "Yeshe Yang". The Treasury of Lives: Biographies of Himalayan Religious Masters. Retrieved 2013-08-19. ↑ Leschly, Jakob (August 2007). "Nyang Tingdzin Zangpo". The Treasury of Lives: Biographies of Himalayan Religious Masters. Retrieved 2013-08-19. Bischoff, F.A. (1978). Ligeti, Louis, ed. "Padmasambhava est-il un personnage historique?". Csoma de Körös Memorial symposium. Budapest: Akadémiai Kiadó: 27–33. ISBN 963-05-1568-7. Wikimedia Commons has media related to Padmasambhava.